Oasis in Paradise, located in the prestigious gated neighborhood of Sunset Palisades in Shell Beach. 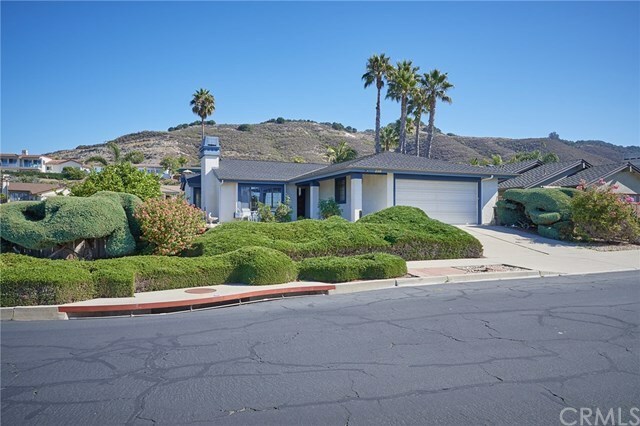 You'll fall in love the moment you step into the courtyard with the beautiful blue Pacific Ocean Views and Colorful Sunsets on this large corner lot. This 3 bedroom, 1 3/4 bath home features an open beam, vaulted ceiling, a living room with warm and cozy fireplace, and dining area with sliding glass door to backyard. The kitchen has been recently remodeled with Corian type countertops, stainless steel appliances and a corner sink with large windows to enjoy the serene backyard with fruit trees. The master bedroom has vaulted open beam ceilings, plantation shutters, walk in closet and sliding glass door to it's own patio. Master bathroom has a recently remodeled walk in shower with new tile and a splash of decorator mosaic tile. The other two bedrooms are spacious, one with built in bookshelves which is currently used as an office and the other bedroom is being used as a den with sliding glass door to patio. The oversized double car garage has been built with an option for another bedroom or bonus room. You'll enjoy entertaining in your backyard with plenty of room for BBQ's, gardening, and your favorite pets.